I miss my Abraham Lincoln, blue-eyed Indian and Narnia buddies from my Toronto and Ohio travels. Leaving Spokane at dawn left me travelling solo to Seattle. On the long, read L-O-N-G, flight from Seattle to Newark I sat next to two middle-aged lovebirds which is really worse than teenage lovebirds, that didn’t have word one to say to me, read this as B.O.R.I.N.G. However, we did fly on Alaska Airlines’ new Boeing 737-900ER which is one sweet ride with plenty of leg room and head room. No reclined seats on your knees and, at 5’10”, I’m able to stand up in the seat without conking my head on the storage bin. Two thumbs up Alaska Airlines! For the duration of my flight, I did what any working girl would do, I caught up on emails froms missing work in Friday and read Thich Nhat Hanh’s Being Peace, another selection from Real Simple’s author recommended list of great books. Being Peace is a GREAT book. Nothing earth shattering, just poignant stories and reflections on the importance of meditation, being in the moment and smiling to reflect your inner peace. I love books that make me stop and pause, that inspire me to take notes. Not textbooks, mind you, real life, in the moment pauses that, that make you say, hmmmmmmm. Here in New Jersey, a sweltering and humid 75 degrees (ugh…it’s fall! ), I love to bear witness to the dramatic differences between east and west coasts. Facial expressions, mannerisms, speech patterns, word choices, and garb du jour are fascinating. Tonight I had dinner at a second generation family owned Italian restaurant less than a half mile from my hotel in Harrison New Jersey, next door to Newark. The hotel and Yelp strongly recommended this restaurant so I was surprised, on a Sunday night, that the place was deserted with the exception of two older (late 60’s early 70’s) couples eating dinner and drinking heavily at the bar. I opted to join them at the bar. Angelo, the owner’s son, explained that the Giants played at home and Sunday nights are slow but the food is good. He was right, the food was great. Food, however, did not compare to the epic ambiance created by their clientele. To my right, the two older couples, in full east coast vernacular, while drinking chablis, were discussing Florida, back in the day compared to their current visit where the site they visited was closed due to the government shut down (no problem, they had been their before) and how the one woman was getting all bit up by something, perhaps the homeless guys’ dog’s fleas! ACK! This conversation was injected with commentary on the Dallas Cowboy beating by the Denver Broncos. The restaurant didn’t need any more customers, there was plenty of entertainment. Then walked in three drunken 30-somethings, a guy and two girls who sat at the bar to my left. The guy had obviously been to the restaurant many times and was on friendly terms with Angelo the manager/owner. Following drunken conversation is difficult to the sober ear but from what i could gather, the one girl was making moves on the guy, after she just broke up with his brother…or somethin! They were funny as hell though, adding a full comedic routine to the travel diaries to my right. 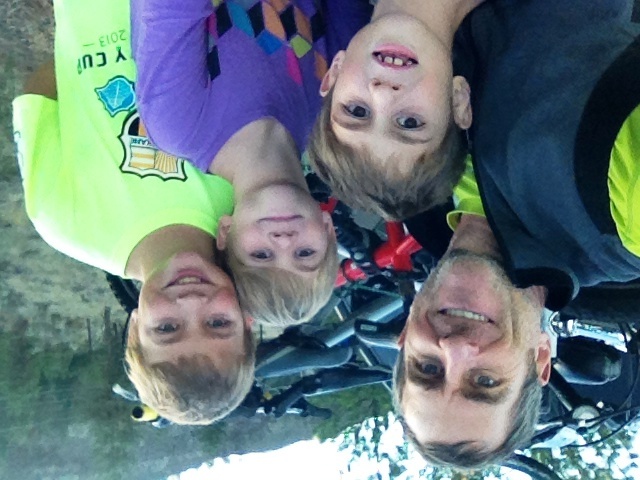 While I was gallivanting across the country, Vince took the boys on a 6 mile bicycle ride (as far as Andre’s scrawny little 8 year old legs would take them) on the Centennial Trail by Riverside State Park, northwest of our house along the Spokane River. To make my day complete, I got to talk to my girl baby! We talk 3-4 times a week, but I love every conversation we have together. Her birthday is coming up quick at the end of October and we’re planning her trip up for Thanksgiving. I can’t wait to see her! Stay tuned for more east coast adventures. Though I have excursions planned, I am in town for business. Monday, Tuesday and Wednesday are events at Rutgers University and New Jersey Institute of Technology. I need to meet with our NJ office leader before heading to our Chicago office on Thursday.